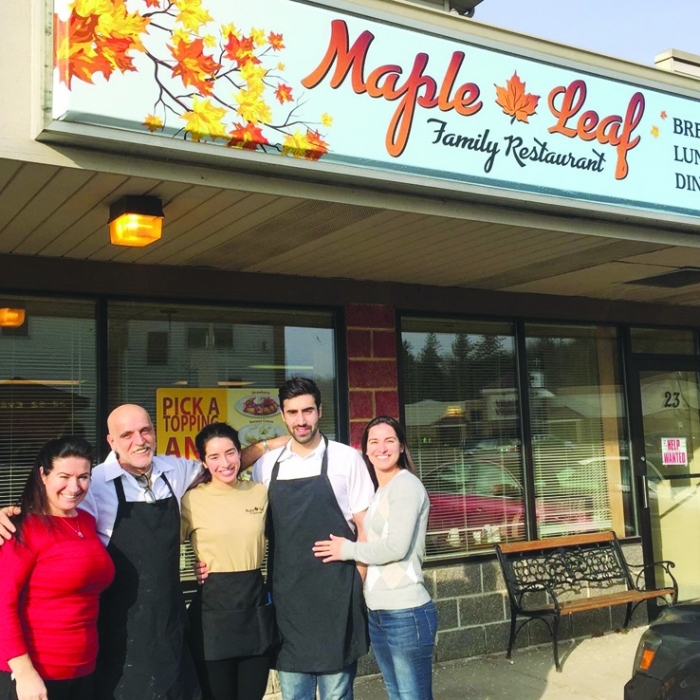 The Ademi family opened Maple Leaf Restaurant in Cross Plains on Dec. 18. It’s -3 degrees Fahrenheit in paradise today. Paradise, in this case, being Wisconsin in the month of January. That’s the way the Ademi family sees it, at least. Babi and Viki Ademi came to the United States from their homeland in 1984, in pursuit of the fabled “American Dream.” Babi said that growing up in Macedonia, a country steeped in poverty, he fantasized about coming to the United States. “To us, it seemed like paradise,” Viki agrees. There’s something quintessentially American about the Ademi family’s story. Although their tale begins far, far away. “We suffered there,” is all Viki likes to say of the country whose shores they left. In many ways, they found what they were looking for here. They ran restaurants for years elsewhere in Wisconsin, then took on factory work, all to support a growing family they hoped, in perfect keeping with this well-worn fable, would have more opportunities than they had. The newest chapter in their story is the Maple Leaf Restaurant, which they opened last month at 23 Glacier’s Edge Square in the Village of Cross Plains. It’s a place where you can go to find homemade comfort food, along with a heaping side dish of family. Babi and Viki’s children – Shipa, Sheli and Shawn – are now young adults. The family is back in the restaurant business, this time with their children shouldering some of the load, in order to support Shipa while she studies medicine on the East Coast. While most eateries purport to be “family restaurants,” Maple Leaf really is. They serve breakfast, lunch, and dinner. The menu covers the usual eclectic American terrain: omelets in the morning, burgers at lunch, and fried chicken at dinner. It also includes the Ademi family’s twists on a variety of classics. Every day, customers are greeted with special soups and dinners. Those specials tend to transcend restaurant fare; with stuffed cabbage rolls that taste like something you’d eat in the warmth and atmosphere of an Old World grandmother’s cozy kitchen. On this particular afternoon, Maple Leaf is alive with an assortment of activity, all of it blurring the line between family and work. New stoves are being installed in the kitchen, requiring an endless game of musical chairs as one family member after the next is called into the back to make sure things go according to plan. Viki, between serving up cup after cup of piping hot coffee, frets that it might not be the perfect day for a newspaper photo shoot, because she was “up all night, crying.” The reason for her tears is her eldest daughter, who is pursuing a doctorate in New York, and who left only hours before. While Sheli chats with a customer and wipes down the lunch counter, and Shawn talks to the technician who’s helping to install a stove, and Babi whips up some special meals, Viki clutches a framed photo of her eldest daughter, smiling with pride and saying how much she loves her. Maple Leaf opened its doors on December 18, and in the few weeks it’s been open, it has already starting to develop its own identity. Located in the same plaza as a Culver’s, a Subway, a Piggly Wiggly, and an assortment of other businesses, Maple Leaf is uniquely its own. Babi, visibly fatigued but smiling, says they have a simple philosophy. Some of Babi’s earliest memories are of food. His mother’s Hungarian goulash, for example, and her savory meatloaf. “We use her ideas, and my father’s,” he explains. Shawn recently earned his bachelor’s degree, so now he’s at work in the new restaurant, as they all labor to support Shipa while she studies medicine. It’s only fair, they say, because she spent several years helping them. Working with family can be a challenge, but you get the sense that Babi and Viki wouldn’t trade it for the world. While it’s cold outside, the ambiance inside Maple Leaf is warm, as is the food. The location, under different ownership, was formerly Cross Plains Family Restaurant. That closed, and when the Ademi family found the spot, they felt it was a good fit for them and their potential customers. Shawn, 25, is taking on much of the work, learning from his parents as they go. He describes Maple Leaf as a “mom and pop” diner. “Every morning, we get up early and make the special soups, roll the cabbage, that kind of thing,” he says. If customers are lucky, they might even find Viki’s honey-drenched baklava on the menu sometime soon. Shawn says his parents have a typical, American “pull yourself up by your bootstraps” story. That amiability has gone both ways, he says. Local businesses, as well as citizens in the area have been warm and welcoming. As for his favorite dish, Shawn is somewhat hesitant to admit his: “I’ll be honest; greasy food is the best. I can’t stay away from it.” In keeping with that, he’s been experimenting with deep fried cookies, trying to create some new desserts. They do, of course, offer lighter meals as well. Dishes clatter, the phone keeps ringing, and the cavalcade of family members bursting in and out of the swinging kitchen door continues. At the lunch counter, Sheli, her long black braids trailing down her back, tidies up and asks a customer which of two dishes he enjoyed more. Viki has reached Shipa on her cell phone, and her face lights up with pride. The pretext is that Shipa might want to add something for the story about her family’s new restaurant. The real reason might also have something to do with the fact that they simply wanted an excuse to hear her voice again. They banter back and forth for a moment before he goes on his way. The rest of the family points out these are the kinds of friendships they are already developing with their customers. It’s the kind of place, they say, that feels like home.